With Hollywood firmly fixed on the idea that 3D is the future of home entertainment, there's one company who wants to bring you 3D in the home for free. Next3D has announced that it is expanding the availability of its movie player, by offering it to both Mac and PS3 users. Currently, the 3D movie player is only available for PC users and those with an Xbox but the new announcement means that most people will now have the ability to play full 1080p theatrical 3D high-definition movies in the living room. Next3D demoed the movie player on the PS3 at this year's Game Developers' Conference inSan Francisco. DJ Roller, Co-Founder of Next3D, said about the feedback the player is getting: "The response has been phenomenal. "Clearly the movie industry is ready for a home 3D audience, and the home 3D audience is primed to emerge. Next3D is on course to be the first to deliver." 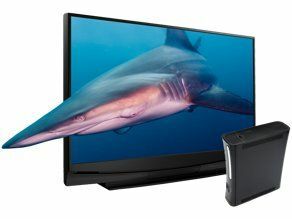 To view 3D content on the player, you will need a compatible 3D-Ready TV, LCD 'shutter glasses'. To sign up for the Beta, point your browser to www.next3D.com.